Let’s start with an introduction: Who is Michael Livingston? I’m someone who wears a lot of hats. In my day job, I wear the hat of being a professor of English at The Citadel in Charleston, SC. I teach courses mostly in medieval literature — Beowulf, Chaucer, and such — but I publish far more widely in literature and history. Most of my colleagues refer to me as a cultural historian specializing in the Middle Ages, and that fits well enough — except that I also publish a fair amount on the works of Tolkien and other modern fantasists. And now, thanks to The Shards of Heaven, I get to add the Hat of Novel Writerness, much to my great astonishment and glee! 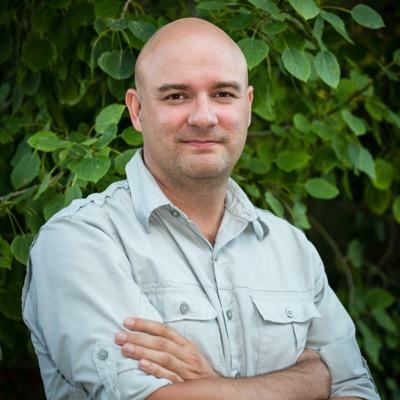 Your debut novel, The Shards of Heaven, will be published by Tor this month. It looks rather fabulous: How would you introduce it to a potential reader? Is it part of a series? The Shards of Heaven is the first novel in a trilogy of the same name. It’s the story of fantasy and history colliding at the rise of the Roman Empire, as the children of Caesar fight to find and control the legendary artifacts of gods both old and new, and a new myth is born in the struggle. The larger trilogy traces the story of the Shards through about thirty years of ancient history, following an adventure across the breadth of the Mediterranean Sea, from Rome to Egypt, from the frontiers of Spain to Jerusalem and the fabled lost city of Petra. It is, as you say, rather fabulous. And I’m not biased at all! What inspired you to write the novel and series? And where do you draw your inspiration from in general? The story of the Shards is actually backstory to another historical fantasy that I began writing many years ago. The more I worked on that later tale, however, the more I realized that its backstory of these artifacts was a terrifically powerful story on its own. I decided to delve into it as a trilogy of novels, and it’s been a truly rewarding choice. My inspiration throughout the process has been history itself. I’ve always loved studying the past: the remnants in literature, the remains in our landscape. And in particular I have long been drawn by the blank spaces on the map of our past: the stretches of shadow between the illumined scenes of our understanding. In a very real sense, the Shards are a way of filling in those gaps in our knowledge by creating a new history hidden between the lines of our textbooks. How were you introduced to genre fiction? I was in elementary school when I first noticed that my brother, who is five years older than I am, had these really cool looking paperbacks on his bookshelf: J.R.R. 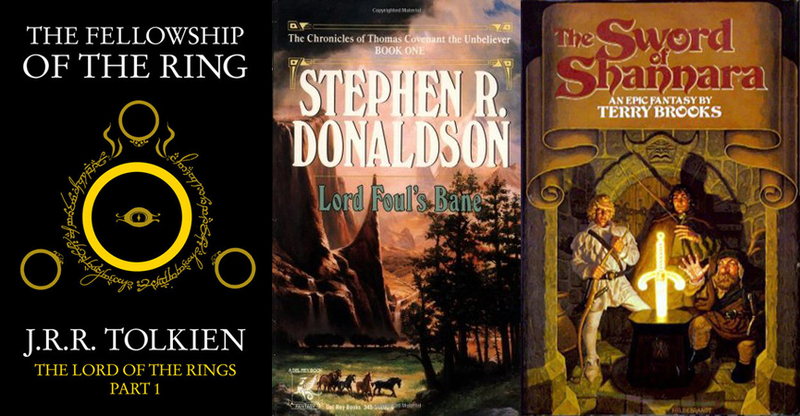 Tolkien’s Lord of the Rings, a couple of Terry Brooks’ Shannara volumes, and Stephen R. Donaldson’s Lord Foul’s Bane. He told me I had to be older to read the Donaldson books, but he acquiesced to letting me borrow The Sword of Shannara, which had beautiful illustrations in it (by the Brothers Hildebrandt). After that I hit Tolkien, and it was all over for me! Over the years I’ve grown to be a voracious reader of genre fiction of essentially every stripe, but my heart has continued to be held most strongly by historical fiction and epic fantasy. That’s probably why I chose to create a story that is equal parts both. How do you like being a writer and working within the publishing industry? I love being a writer, because I cannot imagine being anything else. It’s no lie to say that this was my dream from those early days of reading my brother’s books. I decided to become a teacher in part because I thought it was a noble duty, but also because I figured it would give me summers off to write. Becoming a professor was just an extension of that: I knew I’d be terrible trying to teach younger students! The publishing industry is a wild and bewildering land that is absolutely full of wonderful people who share a love of the written word. I am fascinated by it, and I am fascinated by them. I think the thing that has most astonished me, in fact, is how much I truly enjoy being around such fantastically creative and enthusiastic people. I cannot express how wonderful it is to have such talents amassed behind you as a writer. I had the chance to work with an amazing cartographer to create the map of ancient Alexandria that appears in Shards, for instance, and it was an inspiring experience that I will not forget. Do you have any specific working, writing, researching practices? Because Shards is based within our history, I am very much bound by what we think to be true of that past. Characters must do certain things. Battles must go certain ways. Magic cannot move entirely unfettered through events. Conducting research and outlining my interweaving plot, therefore, are very important to my process. When it comes to that research, I tend to “swim” through history, moving through many lateral contexts in order to get the most complete picture of a subject as I can manage. It’s an odd kind of thinking, I suppose, which is focused on the details while allowing those facts to bounce off one another in my brain until they inevitably spark with a connection that I had neither expected nor anticipated. Eventually, this kind of loose, organic thinking will resolve into what I’m trying to grasp, and then I outline out of that a sentence or two of key plot points for each chapter that’s still backed by this factual soup in my mind. As I’m writing, my characters are then free to move about (and surprise me!) within that organic muck — while still doing what history (and my complex plot) require. When did you realize you wanted to be an author, and what was your first foray into writing? Do you still look back on it fondly? Like a lot of would-be writers, I caught the bug early. I was in elementary school when I wrote a story about a special agent who is sent to find and capture the top secret “automosubmajet.” The plot was a total rip-off of Jules Verne’s Master of the World, but my teacher, Ms. Brockman, read the dot-matrix print-out of it to the class and said that she loved it. A number of students agreed. It was one of the first times I felt like I was genuinely good at something, and I loved that feeling. What’s your opinion of the genre today, and where do you see your work fitting into it? The epic fantasy genre appears to be really strong these days, and the same is true for historical fiction; terrific in both cases, I think, since I really see the Shards of Heaven series as having a foot in both worlds. Looking across the full breadth of speculative fiction genres, however, what I’m most pleased about is how the field has grown more and more acceptable about what makes for a valid tale, compelling characters, and narrative techniques. This openness is vital to the health of the art. Do you have any other projects in the pipeline, and what are you working on at the moment? The Temples of the Ark, which is the sequel to The Shards of Heaven, is being polished up for publication next year. So that’s keeping me busy on the fiction front, while on the academic side of things I’m working on a textbook about war in the Middle Ages. There’s never a dull moment for me. What are you reading at the moment (fiction, non-fiction)? At the moment I’m deep into medieval accounts of war for the aforementioned textbook, but I also have a stack of pleasuring reading that wants my attention. 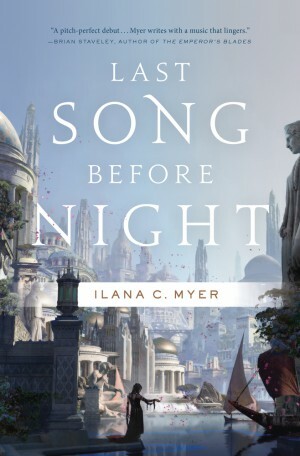 Topmost on that stack right now is Ilana Myer’s new novel, Last Song Before Night, which looks fantastic. What’s something readers might be surprised to learn about you? My brother and I, climbing through canyons in the American Southwest, once discovered a complex of uncharted Anasazi ruins. It had lain undisturbed for centuries, still littered with corncobs and pottery sherds. What are you most looking forward to in the next twelve months? I honestly can’t wait to get started on book three of the Shards of Heaven series. Book one is a pretty amazing adventure, I think, but I am confident that book two is even stronger. And since my outline all along has pointed to a massive climax in book three… well, I’m anxious to see it happen! Speaking of which … I should get back to writing. Thanks for having me! Julius Caesar is dead, assassinated on the senate floor, and the glory that is Rome has been torn in two. Octavian, Caesar’s ambitious great-nephew and adopted son, vies with Marc Antony and Cleopatra for control of Caesar’s legacy. As civil war rages from Rome to Alexandria, and vast armies and navies battle for supremacy, a secret conflict may shape the course of history. Juba, Numidian prince and adopted brother of Octavian, has embarked on a ruthless quest for the Shards of Heaven, lost treasures said to possess the very power of the gods-or the one God. Driven by vengeance, Juba has already attained the fabled Trident of Poseidon, which may also be the staff once wielded by Moses. Now he will stop at nothing to obtain the other Shards, even if it means burning the entire world to the ground. Caught up in these cataclysmic events, and the hunt for the Shards, are a pair of exiled Roman legionnaires, a Greek librarian of uncertain loyalties, assassins, spies, slaves . . . and the ten-year-old daughter of Cleopatra herself. 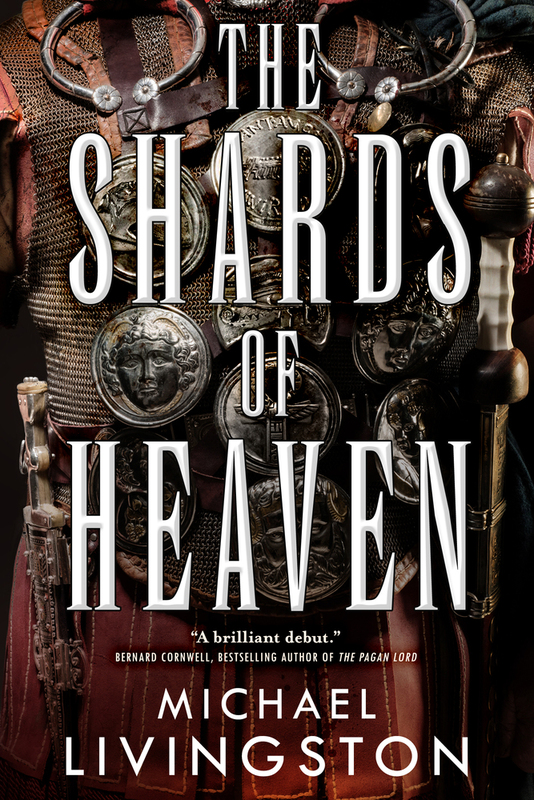 Michael Livingston’s The Shards of Heaven reveals the hidden magic behind the history we know, and commences a war greater than any mere mortal battle. For more on Michael Livingston’s writing and novels, be sure to check out his website, and follow him on Twitter and Goodreads. This was a great interview ! 🙂 I have a copy of the Shards of Heaven that I need to read and review and I can’t wait !